Facebook's "authentic name" policy is stepping on the toes of many minorities. Dear, rainbow-striped Facebook users: A part of the LGBTQ community actually wanted you to #LogOffForPride instead. 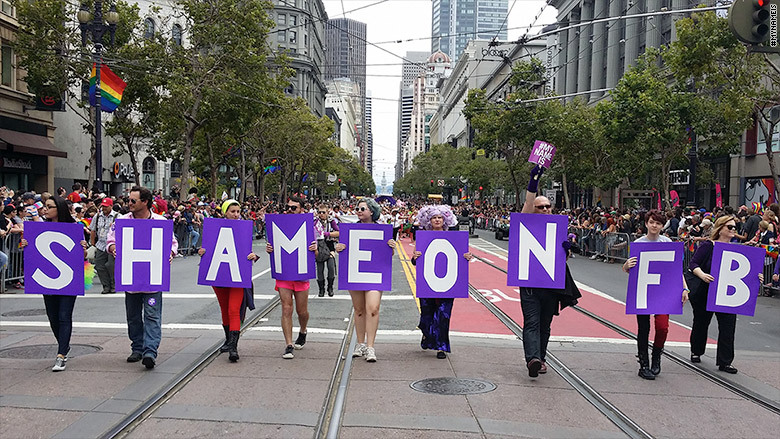 When hoards took to the streets to appreciate marriage equality, around 70 members of #MyNameIs-- a coalition of LGBTQ people, Native Americans, survivors of domestic violence and others whose accounts had previously been reported -- marched at the San Francisco Pride Parade with signs that read "Shame on FB" and "#MyNameIs" to protest Facebook's name policy. The group had earlier petitioned to stop Facebook (FB) from participating in the Pride Parade, but SF Pride voted to allow it. "Facebook is proud of our commitment to diversity and our support of the LGBTQ community as a company and an employer," a Facebook spokesperson said. "We have been strong supporters of the San Francisco parade for many years." Yet the people who get booted off the site for the names they choose to be known by remain unconvinced. Slow change: Facebook users can report people for using fake names. After complaints from LGBTQ communities and others who want to protect their identities, Facebook has altered its policies. Instead of "real names," Facebook now asks for users' "authentic identity." Since then, Facebook has restored thousands of previously blocked accounts belonging to people who use their non-legal names on the social network. "But that was just a Band-Aid," said Lil Miss Hot Mess, a drag queen whose account was temporarily blocked last September due to a fake name report. "The more we were helping people, the more the overall cause was hurt. It seemed that Facebook just wanted to handle things case by case instead of changing the policy." Facebook has expanded options for accepted IDs to include library cards, mail and magazine subscriptions amongst others. "But I don't have a library card under Little Miss Hot Mess," the San Francisco-based drag queen said. "Plus, they ask that the IDs have birth dates and photo -- a library card never has a photo and nor does mail." Identity crisis: Other members of the #MyNameIs protest say that Facebook refuses to accept people who are questioning their identities. Dottie Lux, a lesbian burlesque producer and performer, says that people in the LGBTQ community are likely to have a different name because of lack of support from family and friends. "It's been really important for me to hone my own identity and figure out who I am," says Lux. "Facebook has told me I don't exist except to the people who gave birth to me." Zip, a trans employee at Facebook who initiated the company's much applauded custom gender feature, was herself blocked from Facebook on Sunday. "I chose my Facebook name six years ago, as I began my transition. Every person I've met since then has generally known me by that name, and in part this is precisely because I use it on Facebook," Zip, who used the name on her Facebook employee badge, wrote for Medium. Facebook needs to allow marginalized communities to have access to friends and support without adopting a forced name, Zip stressed. 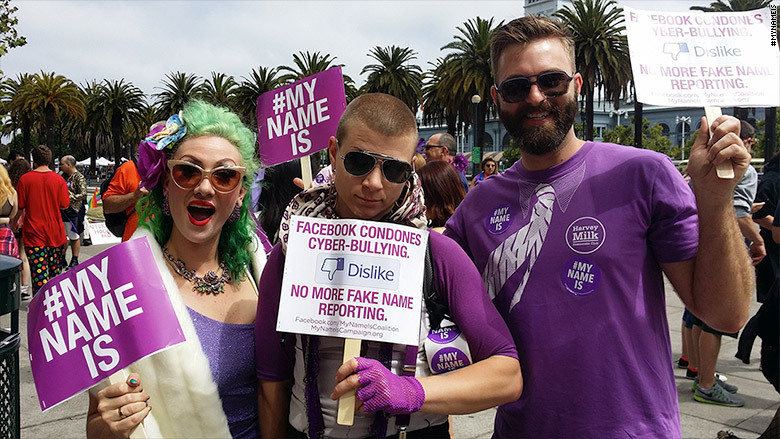 Related: Drag queens lead "real names" protest at Facebook. Real names, real dangers: Facebook says that it authenticates identities is to provide accountability, avoid fraudsters and reduce harm and bullying that wears the face of anonymity. But the policy also prevents people from hiding if their identities present a safety concern. "We've heard from women who have been contacted by former abusers or stalkers, and gay and trans people who have feared losing their jobs," said Trisha Fogelman, a domestic violence advocate and campaign member, in the #MyNameIs press release on Sunday. Facebook is adopting feedback but it is reluctant to give up the policy completely, because their policy of authenticity is what differentiates them from other social networks. As a performer, you could possibly prove your authentic identity. But for closeted members of the LGBTQ community, survivors of violence and others who want to use pseudonyms that are not as easily verifiable, the lines get blurrier.